Please contact Brigham City Corporation at (435) 734-6615 for more information regarding lease rates. Sometime in the early 1930's, the Federal Government constructed an airstrip at the site of the present Brigham City Airport. This was done because early airplanes did not have the capacity to travel long distances, the emergency landing fields were constructed about every fifty miles in every direction all over the country. The airstrips were complete with windsock towers and nightlights. There were no hangars, control towers or on site managers at these sites. Sometimes these landing strips were not much better than a dirt road. One individual over Utah State Aviation became acquainted with Harold B. Felt, an ardent aviator and resident of Brigham City. Knowing that Harold lived in Brigham City, he told him that the government was going to abandon the emergency airstrips around the country including the one in Brigham City. He suggested that Brigham City might be able to obtain the field quite inexpensively. Harold told the man that he assumed inexpensive meant one dollar. The State Aviation Director said he would see if he could arrange the transfer. Meanwhile, Mr. 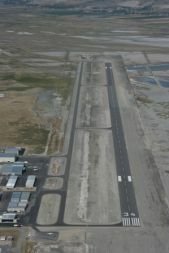 Felt had to convince the Brigham City Council to accept and maintain the airfield. The transfer was made and Brigham City was the proud owner of an airfield. Harold and another aviator, Grant Nielsen formed a partnership to manage the airport which they called Seagull Aviation. Eventually, they brought in a third partner named John Weir. Seagull Aviation owned quite a few airplanes at the height of their business. They started out with two planes. In the late 40's, a little shuttle airplane company came up for sale. Grant and Harold wanted Seagull Aviation to buy the company but Johnny didn't agree. His interest was only in training pilots and managing the airport. That little company was sold to someone else and ended up becoming Frontier Airlines. It was finally decided to dissolve the partnership in the mid-1950's. Johnny Weir continued operating Seagull Aviation until his death in 1993. He logged 36,796 flying hours and provided flight instruction for over 6,500 students. Since the 1930's, the federal "dirt" landing strip has evolved into an 8900 foot long, 100 foot wide asphalt runway with a full 35 foot parallel taxiway and a runway strength which would support the weight of a 737 aircraft.